My original career was as a political campaign consultant, so I watched this election with particular fascination. 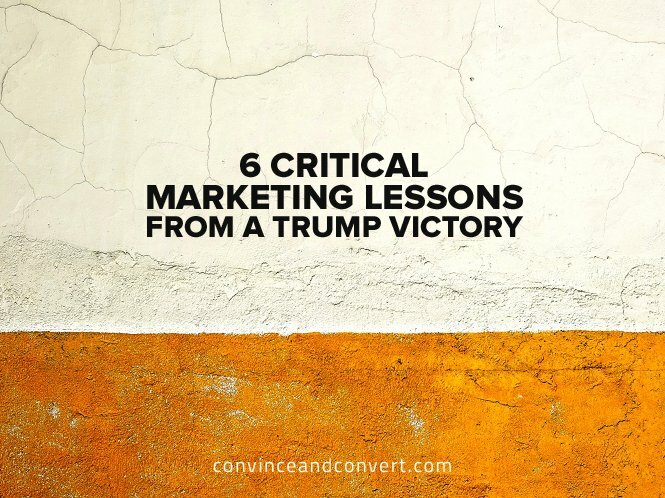 Regardless of your political leanings, I suspect most of us will agree with David Meerman Scott’s post that the best marketer has been elected President. Trump created more contrast than Clinton, and contrast creates clarity. Making people think is a barrier to action in a short attention span world. The truth of your information is less important than its resonance. Clinton had a huge ground game and big data advantage, but that was ultimately overcome by an opponent that created a higher passion level. Clinton has had an authenticity problem for many years. Even Saturday Night Live pilloried her for it. Whether Trump’s positions as a candidate are authentically his remains to be seen, but he was perceived as far more authentic than the electorate. Trump was outspent significantly, but was the more relevant candidate to his supporters. Exit polls show that Clinton failed to turn out large numbers of Obama voters, indicating a relevancy challenge even with the historic base.